So, Rupert had to take a trip to the emergency vet tonight. Nicholas got on top of his cage and they got into a squabble. When I went to break it up I noticed that Rupert was bleeding. A lot. Nicholas sliced open Ruperts tongue. Poor little guy. He was bleeding all over the place, flinging his head around and getting blood all over us, the kitchen, the walls. There is no emergency vet that knows anything about birds but I thought they might at least be able to get the bleeding under control. So, we went. The vet was very upfront and told me he did not know much about birds. I had to towel and hold Rupert down for the exam because they thought I'd know how to do it better than they would. I hope he doesn't hold that against me. They ended up cutting a flap of skin off of his tongue and giving him some pain medication. The bleeding eventually stopped on its own and the vet told me that tongue wounds typically bleed a lot. The pain med they gave me is called Metacam. Does anybody know anything about it? I don't want to give it to him unless I know for sure it is safe and since the vet didn't know much about birds I'm wary. I did a search online for it but couldn't find much information. The vet did say that it was absolutely safe for birds but I guess I'm a worrier. I also am hoping that he will be able to eat tomorrow. I guess I will only offer soft foods for a few days so it doesn't hurt him when he eats. So, anyway, that was our evening. It was all I could do not to cry when they were holding open Ruperts beak and prodding his tongue while he struggled. I could feel his heart racing through the towel. I do not ever want to have to hold him down again in a situation like that. I felt so guilty. I'm not sure about Truman. Thanks for the reminder though... I will go read through Michaels post about Trumans recovery. Oh man! So sorry that happened, what a nightmare! One reason I chose our regular bird vet is because she moonlights at the local emergency clinic. I have, like a 3/7 chance of hitting her, but that'd be something. I am going to do some research (which I should have done already). Surely there is an Emergency vet in Austin that has at least some knowledge of birds. I just need to find out where they are. I bet if I called my regular vet he would be able to recommend somebody. I feel stupid for not being prepared and knowing already. When I asked the vet tonight they said there wasn't anybody but they could be wrong. Poor Rupert!!! Metacam is fine for birds, as long as the vet prescribed the correct dose. Here's a formula so you can check. Rupert's weight in kg (eg. 0.120) multiply by 0.4mg/kg then divide by the concentration of the drug. Here in New Zealand metacam oral comes in 1.5mg/ml (the dog formulation) or 0.5mg/ml (the cat formulation). It should be written on the bottle. So assuming it's the 1.5mg/ml formula and assuming Rupert weighs 0.120kg then the formula should look like this. Make you sure you give it with lots of fluids so the kidneys are protected. Only give it for 3 days. The tongue should heal super quickly so you shouldn't need it for any longer than that. Thanks so much Birdvet! That makes me feel so much better. I will check the dosage using your formula. And thanks for telling me about giving it with lots of fluids. The vet didn't mention that. Truman was overdosed by the vet on metacam at 5mL when it was supposed to be about .5mL to 1.0mL. They explained to me that the metacam can be given in varying doses based on the pain. It can have side effects on the kidneys so if you are worried, get a follow up blood test to make sure there is no issue. 0.5mL is a very small amount. Just a lick. The first day, the pain must be so bad so giving a bit more probably would be ok. Check the poop and make sure it isn't coming out black as that would be a sign of ulcers or blood in the stool. Reduce the metacam as soon as practical and do not keep him on it more than a week. Reduce the dosage slowly toward the end. I'd ballpark based on what was supposed to be given to Truman, is to start Rupert on 1.0 twice a day for the first day, then go 0.5 and continue 0.25 for the rest of the week. So sorry to hear about this. I didn't finish reading the topic just so I could get this info to you in case it helps. EDIT I see birdvet gave better advice anyway. Hope he's ok soon! I'd like to hear the full story/details when you have a chance. Don't blame the other bird though. Thanks for the advice Michael. I checked the dosage and it looks like they prescribed a bit less than the dosage he should have based on birdvets formula. He's sleeping now but tomorrow I think I'll give him a bit more (the vet put each dose in an individual syringe for me). I don't want him to be in pain. So, what happened was I wasn't paying enough attention. It's definitely not Nicholas's fault. I mean, he did the biting, but I should have been watching better. I had just put away Pippin and Rupert because I was making dinner and about to have boiling water on the stove. I hadn't put away Nicholas yet and then I got distracted by something in the living room. I was in there for a minute when I heard terrible screaming so I ran in to the bird/dining room and Nicky was on Ruperts cage and they were fighting through the bars. I didn't realize that Nicky was on Ruperts cage when I put him away so it's totally my fault. Usually, Nicky stays in one spot. He doesn't like to fly and relies on me for transportation so I usually allow him to stay out sometimes when the other birds are away. (mainly because he doesn't get into trouble when he's out like the other two) He is also never aggressive towards the other birds. Pippin is the one I'm careful with around Rupert. So I guess I was lulled into a false sense of security when it comes to Nicholas. It's ironic... I've been so diligent about making sure that Pippin never gets the opportunity to pick on Rupert and didn't even think about Nicky being the one to attack. I guess it just shows that you can never be too careful. I feel terrible that Rupert has to suffer for my negligence. It happened because he was trapped in his cage and couldn't flee. He's clearly in pain... he won't touch anything with his beak or tongue. I hope it heals quickly. I also hope he can eat over the next few days. As David my husband and Bill, the former owner of Nicholas can attest, Nicholas has a hell of a mean bite. He bit David to the bone on his thumb and took a sizable chunk out of Bills ear and nose. He really got Rupert good too. He had a flap of skin hanging off of his tongue and a crater under it that was bleeding profusely. The good news is that Rupert sat on my shoulder and nuzzled his head up against my neck for a while before I put him to bed so I guess he's not mad at me for restraining him with the towel while the vet cut a piece of his tongue off of him. I had to restrain him three times. I'm really lucky that he's not holding a grudge. No probs for the advice . If you think he's still in pain after 3 days then by all means continue with the metacam. I've given it to birds for weeks but in a hospital situation we monitor kidneys and crops tube with lots of fluids each time we dose them. The dose I gave you is just under half of what can be administered. Some avian vets will go as high as 1mg/kg. I'd definitely only use this dose for 3 days and only if plenty of fluids was taken in at the same time. And based on a proper weight (I just noticed that Rupert is a lesser Jardine's parrot) you could safely give 0.06-0.08mls of the 1.5mg/ml concentration metacam. I'm glad to hear he's forgiven you. 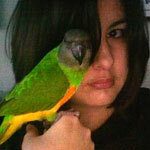 I just recently got through drama's with Johnny, my Nanday conure. I had to amputate one of his toes - drama as he only has one foot so I was terrified he'd lose the other foot. Got back from Boston to find him badly injured with a raging infection from chewing at the dead toe and my flat mate oblivious...sigh!!! Anywho, three surgeries later and twice daily crop tubing with antibiotics and metacam and injections of butorphanol, yet Johnny forgave me and still loves me...phew! And, he's doing well now...can still move around with a stump for a left leg and only 3 toes on his right. Poor wee boy!